All-in-one DVD ripper, backup, converter and editor. Easy-to-use and intuitive interface, fast speed, and high quality. Useful editing functions and perfect video/audio synchronization. Pavtube DVD Ripper is the most powerful and practical DVD ripping tool which provides you an easiest way to edit and convert DVDs to all popular video or audio formats including AVI, MPG, MP4, WMV, 3GP, 3G2, MPEG-4, MKV, VOB, FLV, MOV, MP3, FLAC, MKA, OGG, WAV, AC3, M4A with excellent ripping quality, so that you can enjoy DVD contents with your portable devices like iPod, iPhone, Apple TV, Blackberry, Archos, Creative Zen, iRiver, Zune, Cell Phones, PSP, PS3, Mobile phones, MP4 players, Windows mobile, or any other portable devices. If you like, you can also upload the converted DVD videos to your websites or blogs for sharing after the DVD to FLV conversion. Rip DVD movies to all popular video files such as DVD to AVI, DVD to MP4, MPEG, MOV(QuickTime), ASF, 3GP, MPEG, FLV(YouTube), VOB, Xvid, etc. 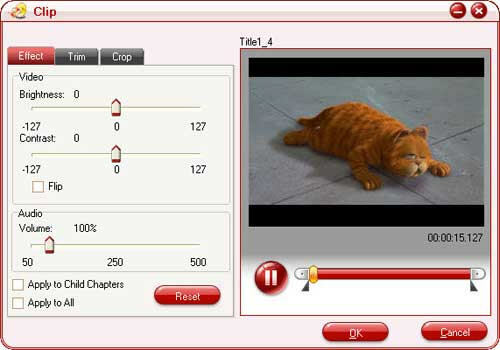 Pavtube DVD Ripper can also extract Audio from DVD to MP3, WMA, M4A, FLAC, AC3, MKA, etc. on Windows. The output video and audio files can be perfectly played on portable players such as iPod, Zune, iPhone, iPhone 3GS, Zune HD, Apple TV, PSP, Xbox 360, PS3, iRiver, Creative Zen, Archos, PMP, Smart Phone, Pocket PC, PDA, cell phone, MP4 Player,and other MP4 or MP3 players. The DVD rip software will take full advantage of your computer resources and offer you the highest speed DVD ripping speeds. you can rip DVD 1.5 or 2 times faster than other similar tools. Supports to add different watermark like text, image, and video watermark. Its video watermark function will add a picture-in-picture effect to your video. fully customize your DVD. With crop, you can cut off the DVD clips¡¯ black edges and unwanted area easily. Trim function allows you to get specific video duration you want, just drag the process bar to the trim points. Support take snapshots of the playing video, Extract pictures by giving intervals from DVD movies, and save them as image files for future viewing. For better vision effects, adjusting the advanced settings such as bit rate, frame rate, video size and so on can meet your requirement to have more controls. AVCWare Blu Ray Ripper All-in-one Blu-ray ripper, DVD ripper, converter, and editor. DVD Ripper for Mac is an easy to use DVD ripping software that designed for Mac users. Copyright © 1998-2011 Share2.com All Rights Reserved.